The African Rock Python is a large, constricting snake that lives in sub-Saharan Africa. The adult African Rock Python’s main predator is man; it is killed for its beautiful skin, meat, and fat (used in tribal medicines). Other predators include crocodiles, badgers, and mongooses. The scientific name of the African Rock Python is Python sebae sebae (Genus, species, and subspecies). 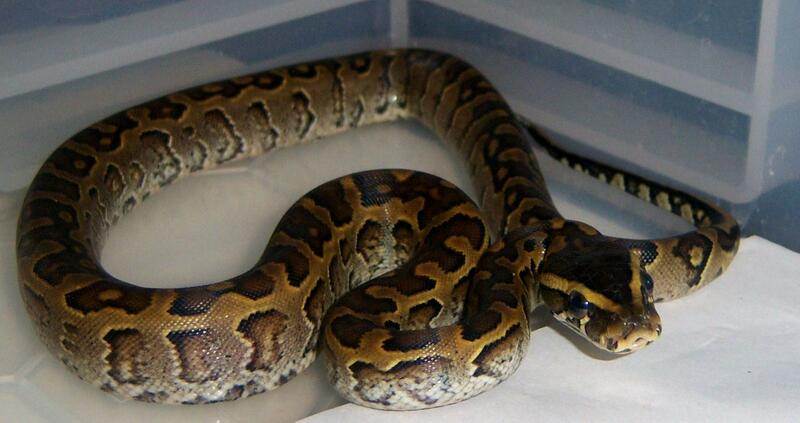 Like all snakes, pythons are cold-blooded; they are the same temperature as the environment. They continue to grow all their lives, getting bigger and bigger each year. African Rock Python average 18 to 20 feet long, but can grow up to 28 feet (8.5 m) long. Their scaly skin glistens but is dry is to the touch. African Rock Pythons are tan with brown spots that have black outlines. A tan V-shape marks the face. The python smells using its tongue. This snake has has no fangs. It uses heat sensing organs in its upper and lower jaws to detect warm-blooded prey (like mammals).